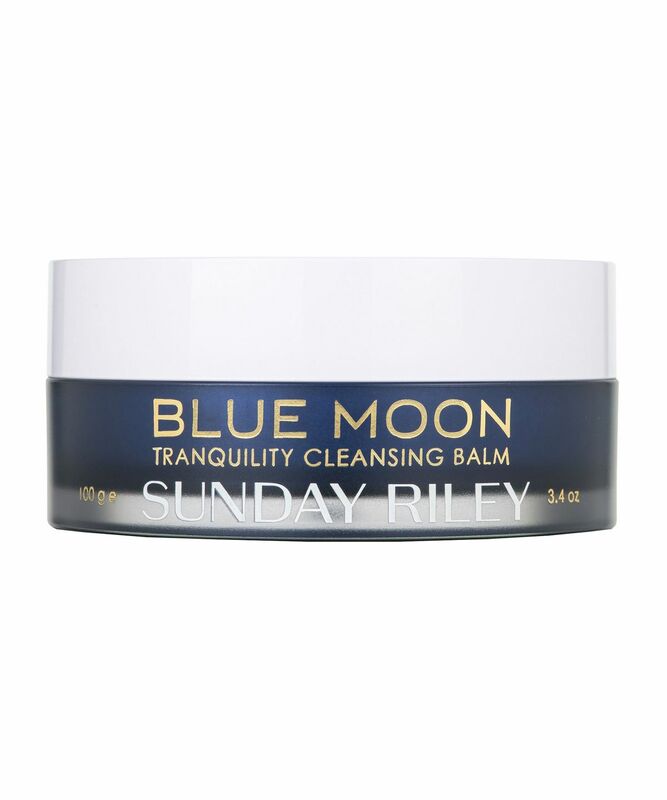 The last word in luxury, Sunday Riley’s wonderfully indulgent Blue Moon Tranquility Cleansing Balm has a skin-soothing and nourishing balm-to-milk texture that’s rich in a cocktail of conditioning plant oils and essences. Gentle yet incredibly effective, the silky formula eliminates every last trace of make up and grime without compromising your complexion’s equilibrium – supporting skin’s natural defences so your face is left feeling clean, calm and contented. 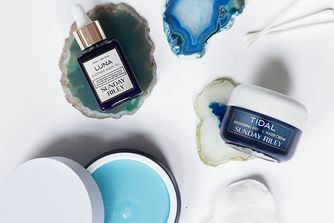 An ultra-gentle, skin-strengthening blend of clean-rinsing sugar-based cleansers, this exquisite blue balm is brimming with hydrating and replenishing ingredients to ‘feed’ skin cells while effortlessly melting make up, dirt and residue. 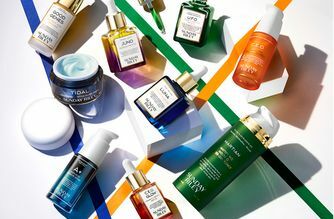 With moisturising cocoa butter to promote skin’s elasticity and ‘stretch’, the star is a blend of azulene-rich oils of blue tansy and German chamomile – renowned for their anti-inflammatory, redness-reducing and healing abilities. The addition of vanilla and sweet orange oils then help to ease anxiety and promote calm – perfect for helping you unwind at the end of along, gruelling day. Just massage over dry skin to dissolve even determined eye make up, then wipe with a warm, dampened cloth to leave skin super-soft and dewy. Morning and night, gently massage onto dry skin for one to two minutes. Using a warm cloth, wipe the balm from your skin sweeping over closed eyes to remove makeup. Balm will turn milky as it cleanses the skin. Rinse any excess with warm water. 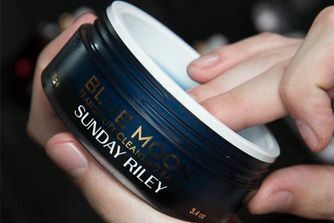 For normal to oily skin, Blue Moon is a great step one cleanser. Follow with Ceramic Slip Gel Clay Cleanser as a step two cleanser to deep clean and close pores. This product can also be used as a hydrating mask—simply leave on for 20 minutes to reveal dewy, plump skin. It's a pricey sugar scrub - basically. I initially bought it because I have a soft spot for blue-hued skin care, and although I enjoy the scent and the balm in itself, I simply do NOT like the grains of sugar. Would buy again if it didn't contain scrubbing particles of any kind. Got this as part of a deal if you bought Luna and Good Genes (which I both love) and I must say that it is probably one of my least favourite cleansers I have ever owned. I used it up simply because it was there but I must say that I'm happy I didn't spend money. Didn't enjoy the texture or the way it cleaned my face or much of anything about it, really. Much better cleansers out there, in my opinion. Just not for me, unfortunately. I've got mature combination skin and this product is far too drying on my skin leaving it very tight. Love Sunday's Good genes and Bionic skin but this one was very disappointing. FAFM, the scent, the SCENT! I have no words to describes how lovely this smells, basically would want to lather this all over my body if I could. Also a great multi-purpose balm: exfoliating cleanse, skin cleanse, hydrating mask, makeup remover. (too nice for that purpose, never will). The sugar crystals melt upon contact with the warmth of your body, leaving a nourishing oily-balmy film on the skin. 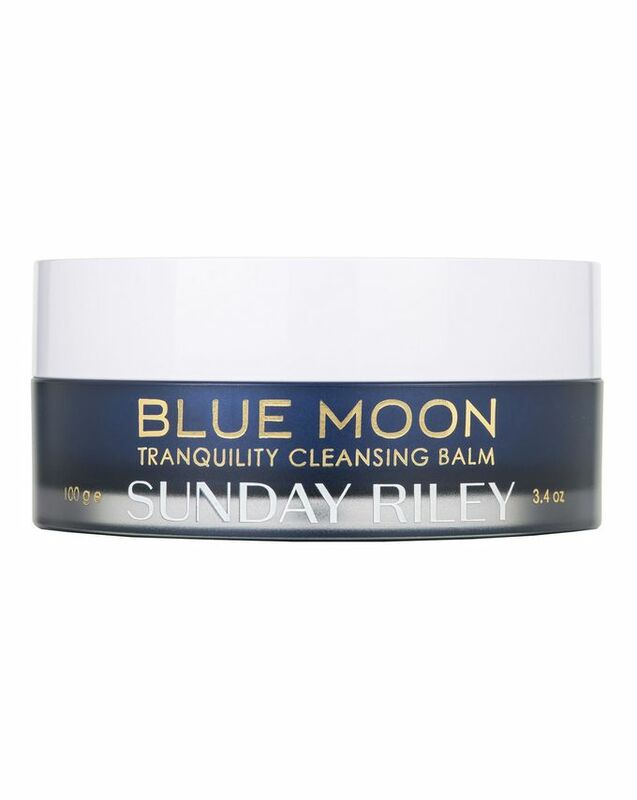 Do a quick facial massage with this and use a hot cloth to get it off, fresh glowy skin x If Sunday ever discontinues this, I'll need to stock up enough for a lifetime. I LOVE this cleansing balm so much. I have dry and sensitive skin and this balm did not only clean my skin but also made my skin feel soft and almost as if it imparted hydration as well!! Love it. Wish it wasn’t this expensive or else I would buy more of this. I have very sensitive, dry and combination (T-zone) skin and have tried oil cleansers and currently using de Mamiel cleansing balm which I adore. I thought I would give this a try as the flatter jar is perfect or travelling. Tried it at home prior to travelling and it cleans well and not drying. I use the Konjac sponge to wipe off the balm after it massaging the balm on my face. I find the balm gentle cleansing for my sensitive skin and leaves a clean clearer skin. Balms are my thing. I spent years not using more than wipes and now find myself in a 180* world where I own, at least count, seventeen cleansers with all but 4 being balms. I love a balm. Despite my oily skin I find them superior to anything else (I enjoy an oil but really isn't a balm just an oil pre liquid stage?) The smell of blue tansy (as this and my Blue Cocoon smell very similar) seems to be a chocolaty orange scent. Great for most, I am not a Terry's fan so it's wasted on me. The problem is if you use this product you either must follow it with an oil (and it's a nice balm so you want to use it as a second cleanse, usually) or use it alone and do not cleanse for long. Otherwise it leaves tight, dry cheeks. One time during a double cleanse with Pixi balm that never usually reacts negatively with me my skin felt so tight it was uncomfortable and unpleasant. It is a little hard in the pot but scrape with a finger pad along the circle. It melts quickly but not overly so to allow for a massage (that as before you need to do minimally or face dry skin) and rinses with a warm cloth nicely with no residue. Does not irritate using around the eyes. I will use it up but there are better products in the £40-£50, which is high for a cleanser, which don't have these shortfalls.